01/2018: A January 2018 message from the Historical Society of Ocean Grove reports a fruitful fundraising effort to restore the town’s 1907 cast iron fountain. Since being listed on the 2017 Ten Most Endangered Places in New Jersey by Preservation New Jersey (PNJ), the campaign has raised nearly $70,000 towards the Phase I restoration costs of $86,500. An additional $20,000 is needed for Phase 2 of the “Fill the Fountain” campaign. This is for site improvement – new water lines, electric lights and security, landscaping, sidewalk, fencing and memorial plaques. Fundraising will continue through 2018, with a plan to rededicate the Fountain in July 2019, to coincide with Ocean Grove’s 150th Anniversary. Ted Bell, chairperson for fundraising, credits the listing by Preservation New Jersey in 2017 as key to creating community interest in the fountain restoration. More information is available at: https://oceangrovehistory.org. Donations can be made to the Fountain Fund, care of the Historical Society, PO Box 46, 50 Pitman Avenue, Ocean Grove, NJ 07756. Founders Fountain (sometimes referenced as FitzGerald Fountain) was placed in Ocean Grove’s Founders Park on July 31, 1907. It later also began to be known as the Fountain of Hope. The fountain was constructed by the J.W. Fiske Iron Works of New York. It was a memorial to Bishop James N. FitzGerald, who was for ten years the second president of the Ocean Grove Camp Meeting Association and a Bishop of the Methodist Episcopal Church. In 1867, Reverend William B. Osborn, a Methodist preacher, had found an ideal camp meeting site, a secluded land on the North Jersey Coast, where spiritual and physical health could be renewed. On July 31, 1869, a group of ministers and friends camped at what is now called Founders Park and, after a candlelight prayer service, dedicated themselves to establishing a permanent Christian camp meeting community called “Ocean Grove.” From this simple beginning, there would emerge a permanent community. Ocean Grove will be celebrating its 150th Anniversary in 2019. Today, Ocean Grove is a leading example of a late-19th-century planned community and contains over 1,000 Victorian homes, as well as examples of many other architectural styles. It is admired for its diversity, its sense of community, its religious commitment, and summer programs of music and the arts. Founders Fountain functioned until 1977 when, as a prank, the water circulation was clogged. This also mirrored a time when the town itself was changing and attention to historical aspects was lacking. The fountain, damaged and in need of repair, came under the ownership of the Historical Society in 1987. Since that time, minimal maintenance has been done. Only the base of the fountain, the rim, and the first of four original tiers remain. While the park housing the fountain is open to the public and in regular use, the fountain itself is in poor condition. The design on its pedestal featuring scallop shells, drills, and tulips is barely visible, and the pedestal itself is deeply cracked and corroded. Various other parts have fallen off and are stored at the society’s museum. Flowers were planted surrounding the fountain as an attempt by the Ocean Grove Beautification Committee to improve the fountain’s appearance. Netting was put in place to discourage children who play in the park and might be tempted to climb it. In 2010, Ocean Grove historian Ted Bell discovered that Robinson Ironworks in Alexander City, Alabama had purchased the Fiske Company and that the company still had most of the original cast iron molds used to cast Founders Fountain. Robinson Ironworks is internationally known for restoring and preserving ornamental and architectural metals. The Fountain and basin rim will need to be relocated to Alabama for restoration at a cost of $86,500 plus an estimated $20,000 for additional plumbing, a new base, and landscape improvements. 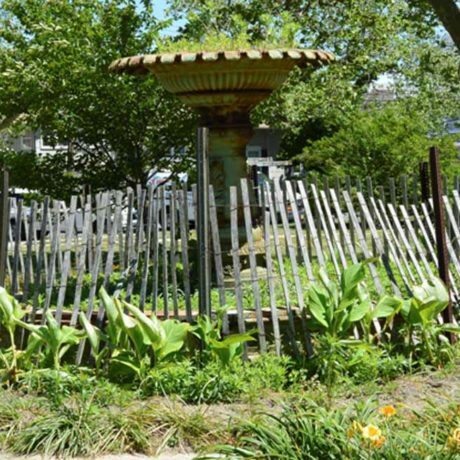 Once the fountain is restored, the Historical Society will continue its maintenance, and utilities will be covered by the Ocean Grove Camp Meeting Association and the Society. The Ocean Grove Beautification Committee has agreed to provide landscape around the fountain and there is the possibility of a Memorial Brick program. This nomination highlights the ongoing financial struggle faced by many small historical societies throughout New Jersey to raise awareness and funds to preserve the State’s diverse and interesting cultural and historical artifacts and structures.